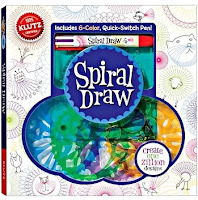 When I saw this book it brought back childhood memories of spiral-doodle. It includes the drawing frame, 4 see-through colour shape wheels, a 6-color pen, and a 48-page booklet of ideas. The possible designs are nearly endless, and will be entertaining to children and parents alike. I could spend hours doing designs with this; not sure how much time my kids will get to play with it. But when they do they love it!